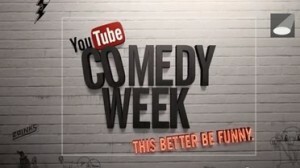 Above all other genres (with the possible exception of ‘popular music’), YouTube is best-known for the comedy that many of its videos seek to provide, and in this case it appears as though the Google-owned site itself is looking to go all-out to provide laughs across a whole week, as a number of comedy stars from the UK and USA come together for a special event. Streaming live and free on a schedule between 20-25 May, stars of TV, movies, and the internet from both sides of the Atlantic Ocean are planning to take part, with the guest list set to include Hollywood actors Vince Vaughn and Michael Cera, while the UK’s biggest stars prove that it will not just be full-time comedians participating, as TV comedian David Mitchell is joined by celebrity chef Jamie Oliver on the list of performers. The first-ever running of ‘YouTube Comedy Week’, will start with ‘a live streamed variety show from Los Angeles’ on 20 May, promising a mixture of musical performances, stand-up, and sketches, while the week ahead will include several other performances and events, along with the timed release of ‘new episodes’ from a number of popular YouTube comedy channels. Two teaser videos released earlier this month promoting the campaign, featuring popular ‘YouTubers’ including Harley Morenstein (EpicMealTime), ‘EpicLLOYD’ (Epic Rap Battles of History), Rainn Wilson (Soul Pancake), ‘Daily Grace’, and Ryan Higa (nigahiga), that can be seen at the foot of the page.